My wonderful husband cooked for us again yesterday. 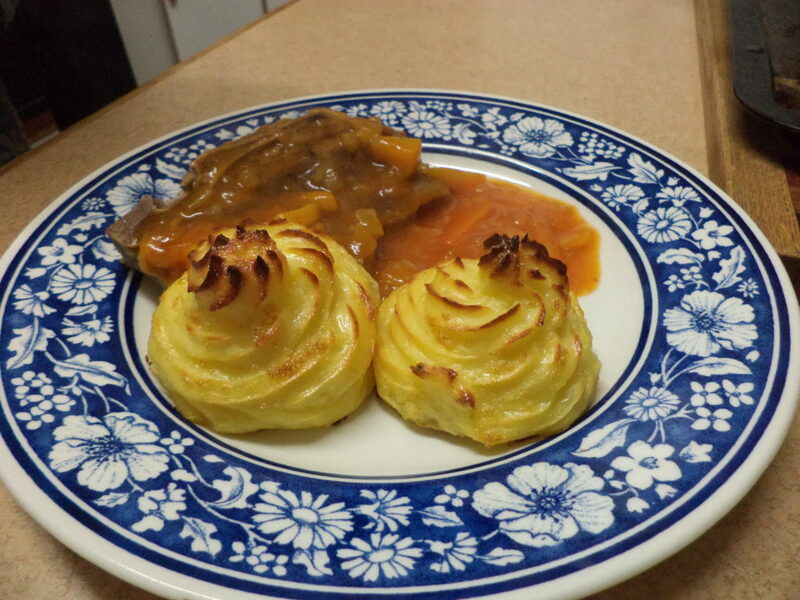 Pork with a beautiful sweet sauce including peaches and much more (it is a secret:) with lovely duchess potatoes. He made these for me before when we were living in England and I loved it, but it was the first time our lovely children tried it as well. The kiddies loved it and I loved it, so the verdict is that you can make it again anytime my liefie. We are looking forward to the next wonderful recipe… You spoil us and we love you! I was born in Vanderbijlpark, South Africa and grew up in Vereeniging. The first time I left home was in 2002 to go to England on a working holiday. Met my husband halfway around the world, got married in South Africa and now have 2 beautiful children. One boy and one girl... Started writing down recipes I grew up with when I was living in England and love sharing them with others. Copyright 2019 by Recipes from South Africa.